At the Badgers Mount pub, just off J4 on the M25 in Kent the Granada clubs have been meeting regularly on the last Sunday of the month (alternatively with another Venue). I thought it would be good to use the venue for a few Scorpio owners too, and I finally made it to the Meet on 24th April 2005. The pub is a large Brewers Fayre with good meals and, almost more importantly, a large car park at the front and the side. Jean and I arrived at 11:30 and found Pegasus from the Forum waiting. He had a warm stall problem and need a peek with the OBD. As I was looking through his diagnostics (no DTCs but a marked fuel trims problem) other Scorpios arrived until I later counted 11. I should have kept a list, so I don't know everyone there now, but we had a good discussion. One owner turned up and announced that he had recently found the site and hadn't joined the Forum yet, but thought he would pop in. We looked over his 12V Ultima saloon. 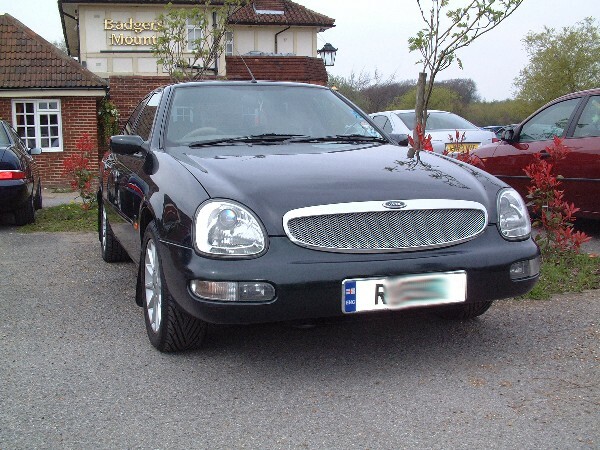 It is a 95 model, but has the facelift radiator grille, which he noticed for the first time when he compared it with others. In ash-black metallic, in Ultima trim, it has the optional headlamp washers and raven leather. I did a quick OBD check on a 16V. This had covered 140K miles and didn't record a single DTC, standard or enhanced. While I was doing that the two 'sisters' arrived. 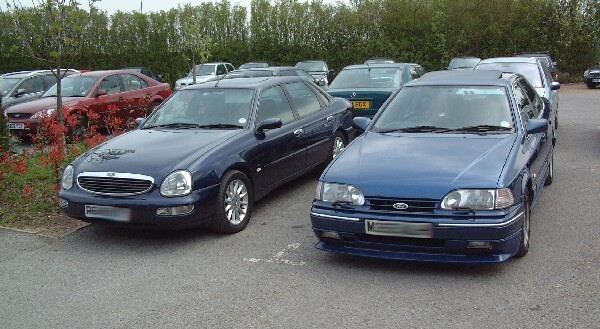 These are the two 16V saloons with consecutive VRMs first seen at the last Orpington Meet. Nice to see them again. Jean and I had a break for lunch on a table for six, where I had steak and a pint of Bodingtons - excellent. Coming out I watched a Granada 24V arriving and managed to get him to park next to a Scorpio 24V for a comparative shot. Two blue Cosworths. On the right a 95 Granada Scorpio with the BOA Cosworth engine, next to a 97 Scorpio Cosworth - BOB engine. Of the two, the Granada look the larger, but both vehicles have an identical floorpan so the difference is illusory. Further along the line from ours, two nice MkII Granadas, an estate and a saloon had appeared. Handsome cars, and their position made a useful comparison to see how the model developed into ours. Is that a Mk I Consul coupe on the left, obviously being rebuilt at the moment. Then three MkIII neatly spaced. Neat effect, that: he has left the grille bars in place but cut the centre ones back to allow space for the wire grille. It's a very neat effect. By the way, the patterning appears only on the photo - this is a moiré effect caused by resizing the image. 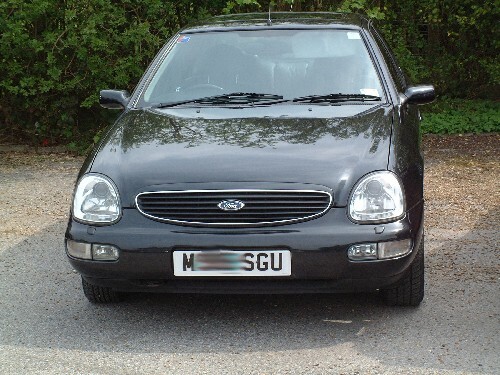 The grille itself is a single colour, and fits very neatly. We thoroughly enjoyed the day and will definitely make another one, work permitting.